Its arches bathed in blue, the Peace Bridge gave a colorful kickoff to UB’s Homecoming and Family Weekend on Oct. 6. From dusk to 1 a.m., the span’s more than 600 LED floodlights flashed and pulsed from Buffalo on the American shore to Fort Erie on the Canadian, delivering a spectacular international light show ahead of the festivities. Those would include groundbreaking for the university’s new field house, alumni talks, faculty seminars, a rock concert, tailgate parties galore and one of the craziest games in the history of college football. 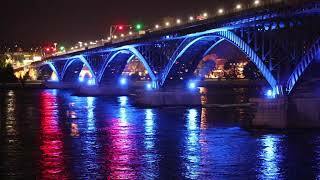 The last time the Peace Bridge lighting system, installed in 2009, shone blue for UB? September 2011, for the inauguration of President Satish K. Tripathi.